Microsoft: How much do you want Google mothership to know? Microsoft's UK MD Ashley Highfield believes that consumers will soon begin to realise that Internet Explorer offers users a different option to Google Chrome's tactic of "extracting as much information as they can about you and passing it back to the mothership." Highfield told TechRadar that he was surprised at just how much data Google's Chrome browser logs about the user, insisting that privacy is a central pillar to Microsoft's slower but more secure Internet Explorer. "[Microsoft's] business model is predicated on big enterprise agreements and software licensing as well as advertising," says Highfield. "We want to make sure that IE is the most secure way, the safest and most private way to get more people onto the internet. "I don't mean this as a criticism, but Google's business model is predicated on their search engine - that's their cash cow. "And so for them, all of their services, and we know this to be the case with Google search, Gmail and now with Chrome, is about it extracting as much information as they can about you as an individual and passing it back to the mothership - which, if you take their word, it brings a service and if you're more cynical it enables them to exploit you more." Highfield points to the unified search and URL bar in Chrome as a key difference between Internet Explorer 8 and Chrome. "In Chrome you obviously have the integrated unibox whereas in Internet Explorer we've purposely kept the URL box and the search box separate," adds Highfield. 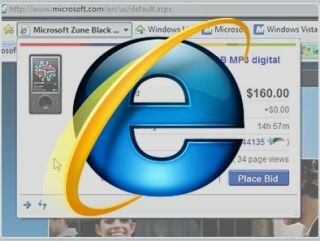 "The reason being anything you type into Internet Explorer's search box… is being sent back to the Bing search engine and trying to second guess what you are trying to do, the URL box does not do that. "I hadn't really thought it through that my URLs in Chrome are being logged, whether or not I had hit return. "I know that this is the debate; that some people won't give a toss and some people will think 'great, if the answers that you are giving me are more relevant' but it just underscores that we [at Microsoft] have a different approach." Of course, Chrome and many of the other major browsers including Firefox and Safari are significantly faster than Internet Explorer 8, but Highfield believes that 'real world' users would struggle to notice. "I just think that in the real world when you are going onto your banking site, checking what's on in the cinema, or looking at the headlines on the Guardian that actually speed is not so much of an issue as some might be suggesting."